I recently spent a week behind the wheel of a 2015 Toyota Camry with the base model 4-cylinder engine and in doing so, I was able to understand very clearly why this is the bestselling car and engine option in the US market – with the following 5 reasons explaining what makes this car so popular. Before getting into the 5 reasons that I believe the Toyota Camry with the 4-cylinder engine is the bestselling car and engine option in America, I should point out that were I to buy the Camry, this would not be the one that I would buy. Through the first 9 months of 2015, a whopping 87.8% of new Camrys sold have been powered by the 2.5L 4-cylinder engine, meaning that just 12.2% opted for the far more powerful V6. The 268hp V6 Camry would be my choice simply because I prefer the extra power, but for someone who is more concerned with efficiency and affordability than high speeds – the 4-cylinder 2015 Camry has no problem selling itself. After spending 5 days driving a 2015 Toyota Camry XLE with the 2.5L 4-cylinder engine, I believe that the following five reasons are why there are more new cars on the road like this one than anything else sold in America. 5. Surprisingly Peppy – While I understand that someone buying a 2015 Toyota Camry with the 4-cylinder isn’t concerned about going fast, it should be noted that the 2.5L 4-cylinder engine provides plenty of power for this roomy midsized sedan. You aren’t going to win many races, but the 4-cylinder Camry has no issues quickly getting up to speed with fast-moving traffic, nor does it struggle to cruise at speeds well beyond any posted speed limit on Detroit area highways. In the past, buying an affordable, efficient, entry-level midsized sedan meant that you were signing up for a car that was a total drag to drive, but the available 178 horsepower and 170lb-ft of torque affords the Camry more acceleration than most owners will ever use along with the ability to easily eclipse the century mark on the open road – which is another thing that most owners will never do. However, when it comes down to it, the 4-cylinder Camry can be driven in a sporty manner and it will respond well, so this is not a car that owners will dread driving. Is it as much fun as the V6 Camry? No, but the 2.5L 4-cylinder engine makes the 2015 Camry much quicker and faster than I had expected, so for the type of buyer interested in the base engine in America’s bestselling car - this engine meets all of their expectations and then some. 4.Predictably Efficient – While the incredible fuel economy levels of hybrid sedans have raised the bar for MPGs very high, the 2.5L 4-cylinder “base” engine in the 2015 Toyota Camry should not be discounted for someone shopping for a midsized sedan with fuel economy being a major consideration. The EPA expects that the 4-cylinder Camry will hit 25 miles per gallon around town, 35mpg on the highway and 28mpg combined. I found that those numbers were all easily achievable without any emphasis on efficient driving and over the course of 8 days, I averaged 29.1mpg. More importantly, I found that when I drove the 4-cylinder Camry in a more gentle manner on the highway, I was able to exceed the expected figure of 35mpg. On a long highway cruise with no real traffic to interfere with my driving style, while maintaining a safe speed of either 55 or 70 miles per hour (the posted speed limit along the route), I was able to get just shy of 38 miles per gallon and I suspect that someone who lives in an area with lower speed limits could get even better fuel economy figures. In short, driving reasonably on a highway with a 70mph speed limit should easily yield fuel economy figures of 35 miles per gallon and depending on driving habits, owners could average better than 30 miles per gallon. 3. Sportier Exterior – This is true of all of the 2015 Toyota Camry models, but the most recent exterior refresh has ushered in the most aggressive face of the Camry, ever. In the past, some models came with a more aggressive look while other packages looked far more subdued, but the entire 2015 Camry lineup has an exterior design with some attitude – and customers like that. While this helps sales of the entire Camry lineup, the fact that the 4-cylinder models have a similarly aggressive look to the more powerful models makes this package more attractive to those buyers who want a car that isn’t so vanilla. A decade back or so, the midsize sedan market in the US was dominated by vanilla vehicles that blended in with the crowd, but the modern automotive market demands that everything have some personality and some attitude – and the 2015 Camry meets those requirements, even with the 4-cylinder engine. 2. Crazy Loaded Interior – In much the same way that affordable, efficient midsized sedans a decade or so back were generally very drab on the outside, they were fairy unimpressive inside when it came to premium amenities. Fortunately, the market has changed a great deal so today’s affordable midsized sedans now have items that were once reserved for luxury cars, and the 2015 Toyota Camry is a shining example of that shift in the market. Granted, my 2015 Toyota Camry was a top of the line XLE model with a long list of optional upgrades, including the premium infotainment system, the convenience package, the technology package, remote start, a moonroof, a wireless charging station and some other standalone goodies, but the advantage to this package is that you can get all of this with the standard 4-cylinder engine. 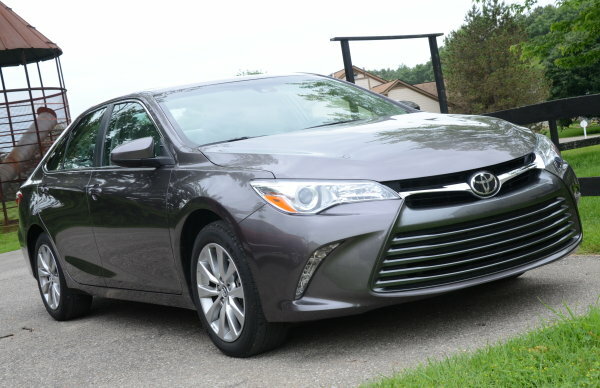 There are plenty of vehicles sold in America which require you to get the most expensive engine option (generally as part of a package) if you want to get all of the bells and buzzers, but with the 2015 Camry, you can get all of the luxury items with the least expensive engine option. In addition to the roomy front and rear seating areas, the Camry XLE comes with heated leather seating surfaces with power control for both front seats, a leather wrapped steering wheel with audio controls and Bluetooth access, a backup camera, a thin film transistor driver information display, remote keyless entry, remote start, dual zone climate controls and ten airbags, all standard. The Convenience Package adds an integrated alarm system, the Smart Key system that opens the front doors and the trunk without having to fish out the key fob, push button start, an auto dimming rear view mirror and the Homelink universal garage door opener. The premium Entune infotainment package adds a JBL GreenEdge 10 speaker system including a subwoofer for premium sound quality, a 7 inch touch screen on the dash that controls the entire system, satellite radio capabilities, voice activated navigation, a CD player, an auxiliary port with MP3 compatibility, iPod connectivity, Bluetooth connectivity to a variety of smart phones and the Entune AppSuite, which includes all sorts of information such as weather, traffic and more. Finally, while the blind spot monitoring system is a standalone option, the Technology Package includes safety gadgets such as the Pre-Collision system, Lane Departure Alert, adaptive radar cruise control and automatic headlight high beams. That is pretty much everything that you can get on the 2015 Toyota Camry XLE and when you consider the other simple standalone options like the lighted door sill plates and the awesome wireless charging station, the 4-cylinder Camry offers almost every feature that you can get in most modern luxury sedans…all without being wrangled into buying a more expensive engine option. 1.Only $33,448 – Most importantly, the reason that so many people buy the 2015 Toyota Camry with the 4-cylinder engine is that all of these features mentioned above are packed into this midsized sedan for just $33,448 out the door. That includes destination fees as well as all of the upcharges of the various options and packages, and even with all of this, the Camry XLE is prices out under $34,000. Those who are happy with the standard features of the 2015 Camry XLE can get this vehicle without the added items for under $27,000, but for just $33,448, you can have all of these luxury amenities in a roomy, sporty looking midsized sedan that delivers better than 35mpg on the highway. Lots of sedans offer all of these features, but not for that low of a price and, in some cases, not without stepping up to a more expensive and less efficient engine option. If you are concerned about performance, you are likely in the smaller group of 2015 Toyota Camry buyers, but if you want a midsized sedan that has tons of interior amenities, great fuel economy potential and plenty of power to speed through the daily grind – it doesn’t take much to figure out why 87.8% of Camry buyers in 2015 opted for the 2.5L 4-cylinder engine. This car embodies everything that made the midsized sedans so popular over the last 20 or so years, but it does so while introducing goodies that were once unheard of in an affordable sedan with a “base model engine”. Don't forget, it is also made here in the USA! Click here for John Goreham's favorite aspects of the Toyota Camry! The Accord touring V6 is $34,600. Honda makes it impossible to order all the luxury items on the Touring while still getting the lighter, cheaper, more fuel efficient engine. Without the dealer installed accessories the Camry XLE MSRP is only $32000. The Camry is also going to ride better, sice you didn't have to get 19* inch wheels whether you wanted them or not. The Camry also comes with a 6 speed Auto rather than a CVT. Camrys are also quieter inside. Camry rides better, far more durable, much quieter than the Accord. The accord is more esthetically pleasing to the eye interior wise and with better materials. The Accord is no where near as durable as the Camry. I've owned 4 Honda/Acura products and they were full of issues. Engines were fine but transmissions were awful as were brakes. My Camry is flawless. My '93 Camry is still going strong at 461,000 + miles. Sure it's the old 2.2 Liter engine, but with reasonable care and maintenance, this machine has proven it's worth time and again. The engine and trans are original and have never been cracked open. I have used synthetic oil since it's purchase, which explains why I have the long mileage. I do routine oil changes and trans fluid changes with filters...It's till a good machine and perhaps I'll trade it when I hit 500 K. Thanks Toyota! I have 2015 Camry LE with 2.5L 4-cylinder engine and on a long highway ride I could get close to 40 mpg twice with 5.8 and 5.9/100L(ON, Canada) respectively by driving with posted speed limit! Is the 2.5 toyota engine direct injection or port injection?